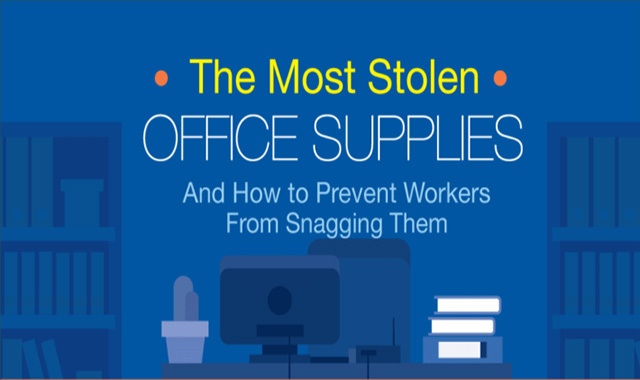 The most stolen office supplies #infographic ~ Visualistan '+g+"
If you’ve ever swiped a stack of sticky notes from your office, you probably didn’t think twice about the repercussions. While sticky note stealing is pretty tame, stolen office supplies can add up over time. In fact, employee theft costs small businesses about $40 billion every year. While employee theft is most prevalent in retail, it affects all types of businesses. One survey found that more than half of employees admitted to stealing from their employer. So which supplies are most commonly taken hostage? Pens, pencils, sticky notes, and paper clips top the list but research shows some employees are brazen enough to steal much larger items like chairs. Want to cut down on office supply theft? Read on for our tips.